(CNN) -- As authorities confirmed the "balloon boy" saga was a hoax, they checked the vessel created by Richard Heene to see whether it could have actually carried his 6-year-old son Falcon. 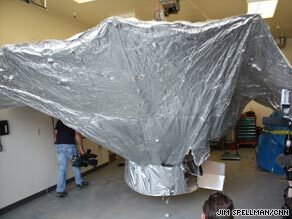 The balloon is displayed at the sheriff's department in Fort Collins, Colorado, on Sunday. During the incident Thursday, when Heene said his 37-pound son may have been inside the flying-saucer-shaped balloon, the sheriff's department contacted a specialist at Colorado State University to determine whether it could carry the child. Based on the dimensions for the balloon that Heene provided at the time, the specialist "determined that it was, in fact, possible for this balloon to have launched," Larimer County Sheriff Jim Alderden told reporters Sunday. But after they recovered the balloon and checked the actual measurements, authorities discovered "it was not capable of lifting off" with the boy on board, Alderden said. Authorities have also tested the base part of the balloon, into which Heene said his son may have crawled. Alderden said that section consisted of a very thin piece of plywood and cardboard sides held together by string and duct tape. "Certainly we wanted to question whether that was strong enough to support the weight of Falcon," he said. Alderden said they came to a "bizarre" finding, that the section actually could handle 37 pounds without breaking. However, in order to go airborne with those 37 pounds inside, the base would need to be attached to a more powerful balloon, he said.